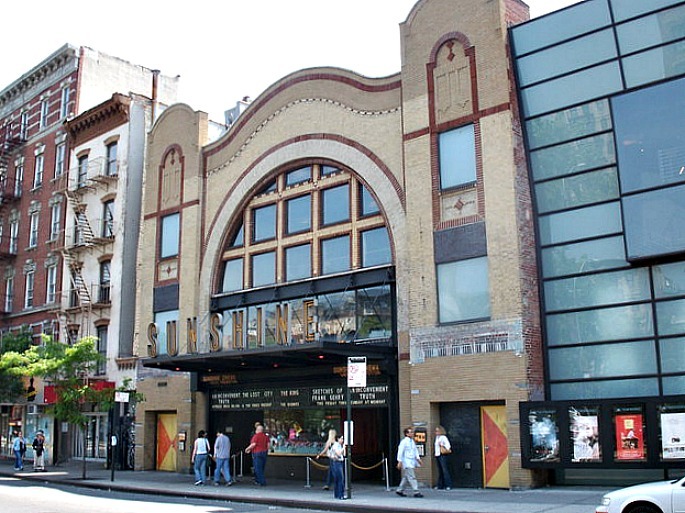 The Sunshine Cinema at 139-143 East Houston Street has been a neighborhood staple since it was built in 1898, but that soon may change, according to The Real Deal. First serving as an anchor for the Lower East Side’s Yiddish theater community, and now as a favorite spot for “art-house movie buffs and devotees of late-night cult flicks,” the theater is now being shopped around to developers for upwards of $35 million. This comes on the heels of a 2012 request by Mark Cuban and Todd Wagner of L.A.-based Landmark Theatres, the cinema’s operator, for a liquor license to turn the location into a dinner-and-drinks theater like Williamsburg’s Nitehawk Cinema. Community Board 3, however, denied the application, despite Landmark’s claims that they couldn’t maintain the Sunshine due to rising rents. The 600-seat theater opened in 1909 as the Houston Hippodrome, a center for Yiddish vaudeville acts and films, according to Cinema Treasures. At this time lower Second Second Avenue was considered the “Yiddish Rialto.” In 1917, it was renamed the Sunshine Theatre, and in the late ’30s it was renamed Chopin Theatre. It then closed in 1945 and was used for storage until, in 2001, it underwent a $12 million renovation by Landmark Theatres and reopened as a haven for indie and artsy films. Sunshine Cinema’s lease, on which it pays about $200,000 a year, lasts through 2018, but with Whole Foods one block away, as well as high-end residential developments popping up like Ian Schrager’s 215 Chrystie Street and the ODA-designed 100 Norfolk Street, the theater lot is ripe for development. In fact, the Real Deal reports that these new buildings “are averaging more than $2,000 per square foot for their in-contract units.” The Cinema site comes with about 44,500 square feet of buildable space or 56,000 square feet with the inclusionary housing bonus.